My embroidered ball is finished, and I am very proud. It took quite a while to cover the whole surface with stitches but I looove how it came out! My embroidery group have been learning to make these and everyone has been fascinated by it. 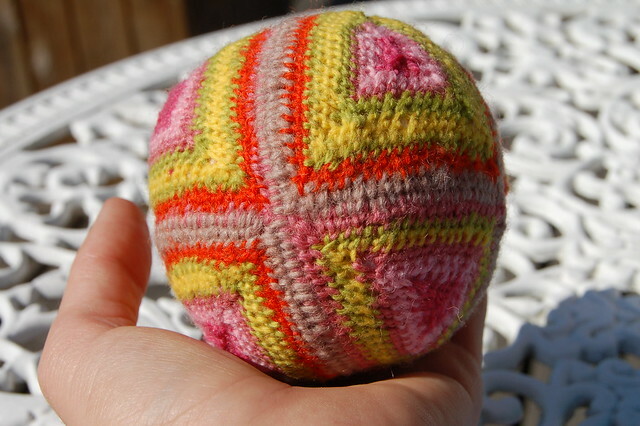 Most of da ladies have done three or more balls already, but I’ve just completed this one. I finished it around Easter so I’m calling it my Easter ball. I will probably make at least one more soon though. It is as southing as hand stitching, and I love making balls! We will have a lot to show at our upcoming Spring exhibition, and I will take photos and show you how they look together of course. The technique is old but our love for it is newfound and shiny! In Swedish this is called singla, and its done with wool thread around a cloth ball. All you do is sew the buttonhole stitch (langettstygn) around a thread instead of into a fabric, round and round the ball. There is a Swedish tutorial for how this is made, called Singla en boll, but I can’t explain it very well in English, sorry about that. Doesn’t it look like its crocheted though? This entry was posted in Crafts and tagged ball, first try, toy making, wool embroidery. Bookmark the permalink. Hi Hanna, I first thought your ball WAS crocheted. How cool…..
Do you avoid stitching into the ball itself ? I really liked it. Amazing! 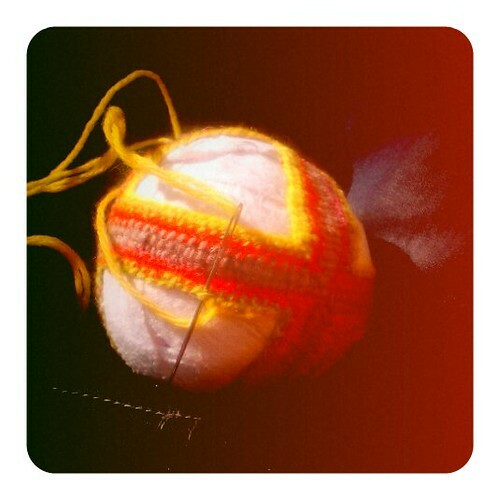 I once learned (as a child) how to crochet and knit a ball, but I’ve never seen an embroidered one. Awesome! I really like the colors you used. I’ve noticed they are the same of your last watercolor paint (“Blessed spring”). I couldn’t imagine that pink, yellow and green match in this good way! Hanna, you’re so well rounded! Wow, this is really impressive! Looks like a very involved project…good for building patience as well as sewing skill! What will you do with it? Is it for decoration? I like the colors you chose. So beautiful, Hanna! Gorgeous colors and all those tiny stitches – wow! Laila, yes, you avoid stitching into the ball, you don’t have to. You just cover it with the stitches. It’s beautiful! They remind me of temari balls. I will have to try this when I have some time.